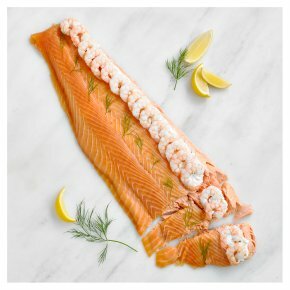 A whole side of skinless and boneless Scottish salmon, poached in white wine and lemon, draped with oak-smoked salmon and garnished with king prawns, soft cheese and dill. Presented ready to serve on a black tray. Filleting removes all major bones; small bones may remain.. Serves 8 as a main course and 12 as part of a buffet. This product is supplied ready to serve and includes a serving platter. INGREDIENTS: Poached Scottish salmon (80%) (salmon (Salmo salar) (fish), white wine, concentrated lemon juice), Scottish oak smoked salmon (11%) (salmon (Salmo salar) (fish), salt, demerara sugar), king prawns (king prawns (crustaceans), salt), full fat soft cheese (milk), dill.